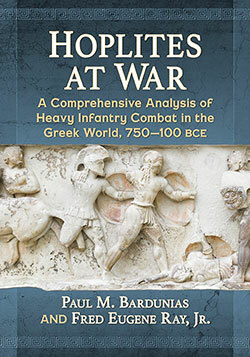 Paul M. Bardunias and Fred Eugene Ray, Jr., Hoplites at War: A Comprehensive Analysis of Heavy Infantry Combat in the Greek World, 750-100 BCE. McFarland and Company: Jefferson, NC, 2016. ISBN 978-1-4766-6602-0 (paperback) 978-1-4766-2636-9 (ebook). 233 pages. In this book, we make use of traditional sources, but combine those with cutting-edge (apt for a book on warfare!) 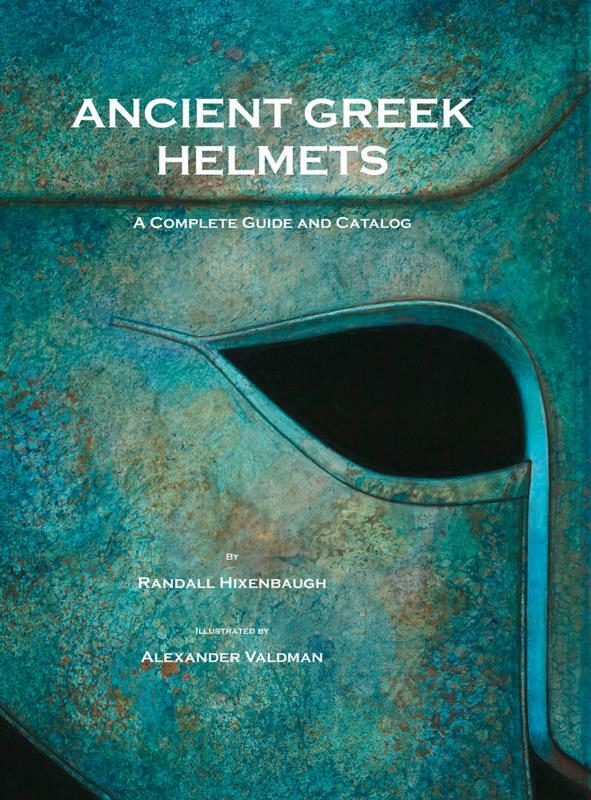 science … We hope the result provides a comprehensive source on hoplite warfare that will advance key debates for modern scholars, while entertaining the general reader. … [what we present here] is an assessment of what we firmly believe to be most probable based on all evidence at hand. While this book’s reach exceeds its grasp, I think it contains some important ideas. 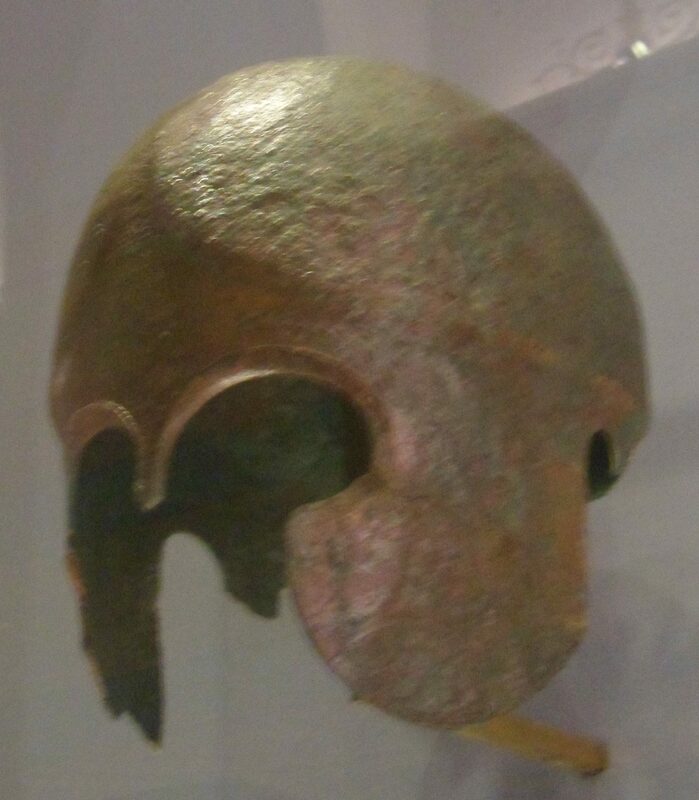 A “Chalcidian” helmet in the Hermitage, St. Petersburg. From Nymphaion necropolis, tomb 16, acquired by the Hermitage in 1876. Attributed to the early fifth century BCE. hang on the wall on unseen pegs. here, belts in abundance and tunics. Alcaeus of Mytilene, fragment 140 Voigt, as quoted in book 14 of the Deipnosophistae of Athenaeus. Most scholars estimate that Alcaeus lived somewhere within 50 years on either side of 600 BCE; Athenaeus lived 800 years later. Translation by David Mulroy, Early Greek Lyric Poetry (Ann Arbour, Michigan: University of Michigan Press, 1992). I quote his translation because he lets his readers see how each of the broken fragments of Alcaeus’ work was preserved. A verse quoted to ornament a work on a different topic is different from a paraphrase is different from a scrap of papyrus pulled from a dump. 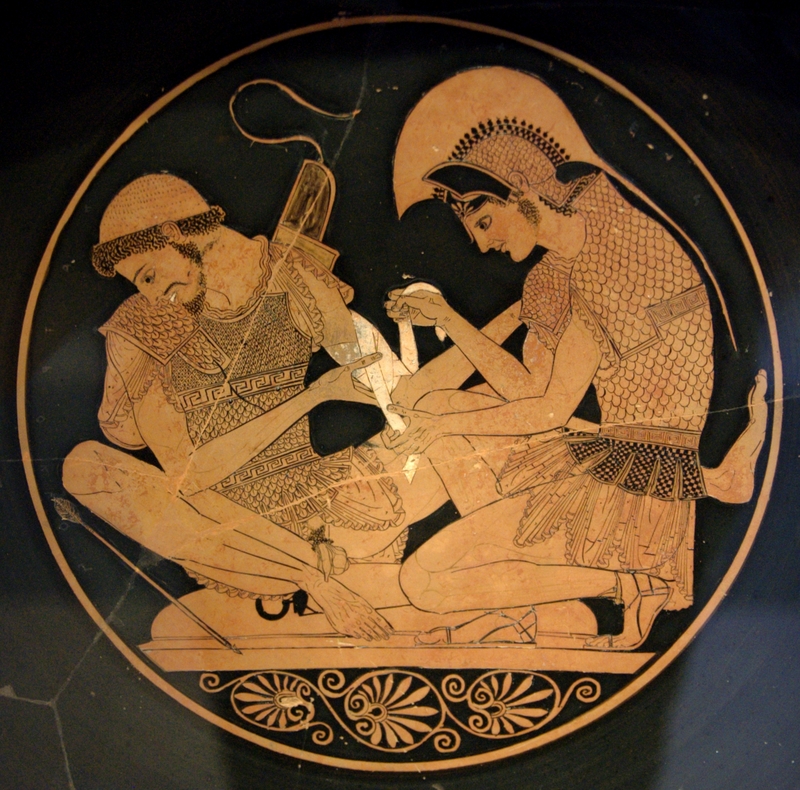 In this case, Athenaeus thought that the poem showed that Alcaeus was more proud of manliness than poetry, and used his poems to urge men to be brave. M.L. West has another prose translation in Greek Lyric Poetry (Oxford World’s Classics); if readers know of any good translations into verse, please suggest them in the comments! 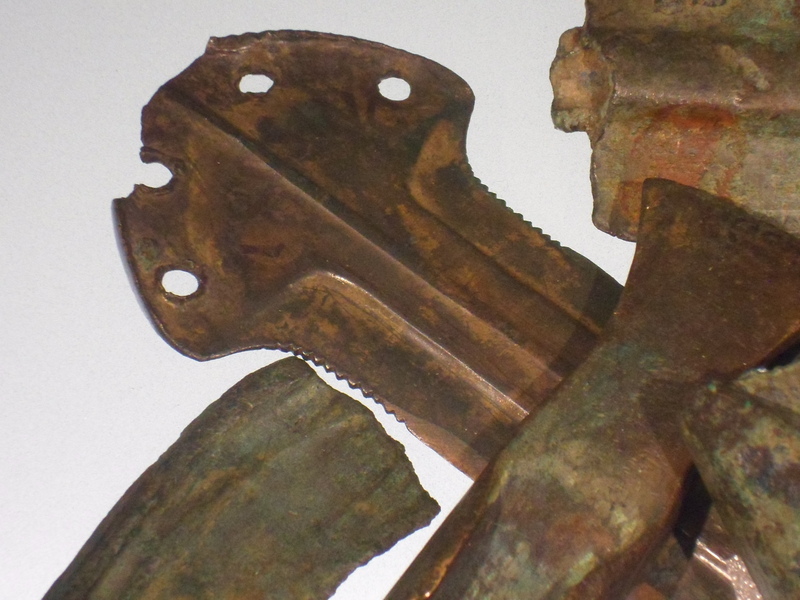 Assorted bronze fragments in the Archaeologisches Museum, Schloss Eggenburg, Graz. Photo by author, September 2015. I am more familiar with this one as πάντα ῥεί but “Alles Fließt” and “everything flows” are perfectly fine translations too. 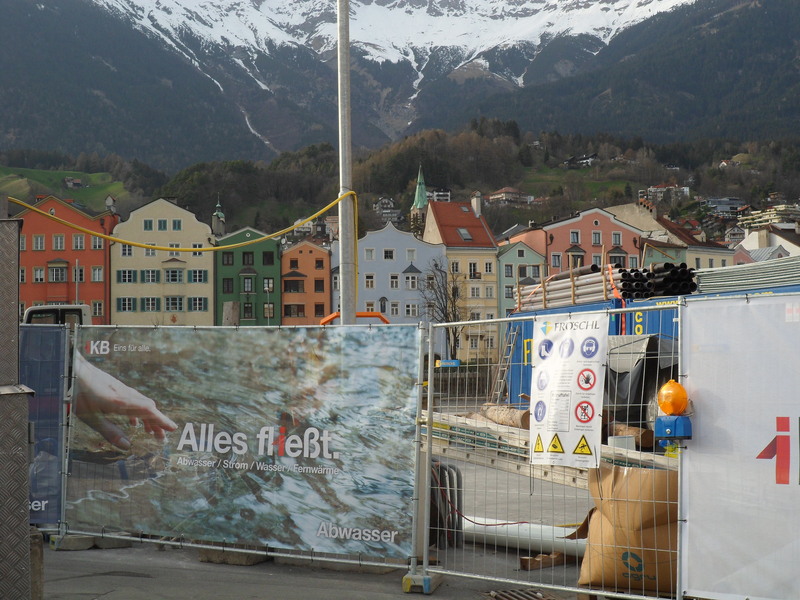 Looking north from the Innsbrucker Marktplatz not so far from Conrad Seusenhofer’s house and the mansions and warehouses turned hotels and souvenier shops, April 2016.